Redsides was made by Miles Pepper in 2001. 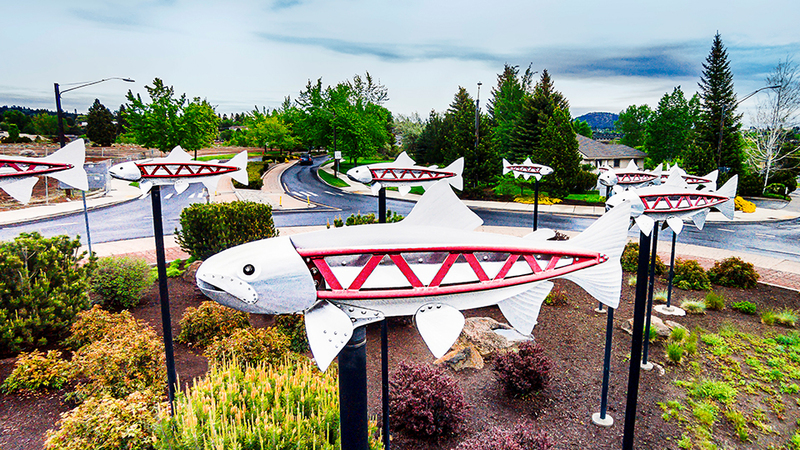 Made of carved steel and red wire, this piece pays homage to the Deschutes-dwelling redsides trout. While real redsides head upstream in nature, this school of kinetic fish moves with the whims of the wind. If you time it right, you may detect a hint of hops in the air, courtesy of one of Bend’s oldest craft breweries right scross the roundabout. Ah, fresh beer and fish. Lunch, anyone?